Audio Research Reference CD9. CD Player & DAC. Replacing the renowned REF CD8, considered by fans and specialized critics around the world as one of the most musical compact disc players ever created, the REF CD9 is the result of four years of in-depth review of the components, circuits and technologies used in Its illustrious predecessor and in the sophisticated model DSPre with the aim of bringing parameters such as definition, dynamics and spatial presentation during the reproduction of CD's and latest digital contents to a never before seen levels. In this sense, the user has the option to resample any of the incoming signals up to 24-bit resolution, including, for the first time, those present in the USB socket, while an analog output section one hundred Hundred to valves ensures an extraordinarily warm, rich and precise sound. 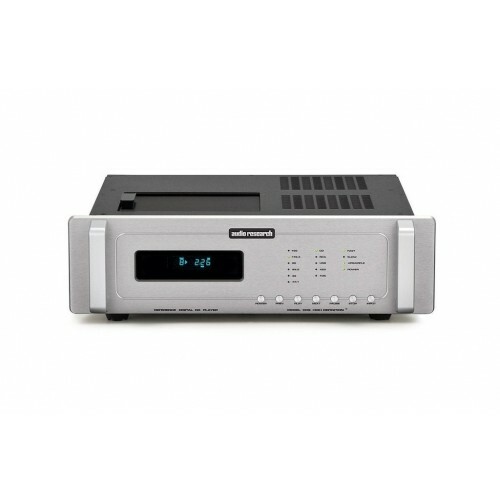 Absolute reference compact disc player with built-in digital audio processor. Equipped with the ultra-precise transport mechanics PRO2R from Philips. Digital audio processor with four D / A converters with 24-bit resolution and sampling at 192 kHz in mono mode. Two very high precision timing clocks, one for sampling frequencies 44'1 / 88'2 / 176'4 kHz and one for sampling frequencies 48/96/192 kHz. Resampling of any incoming digital signals. Frequency response of 3-96,000 Hz, +0 dB, -3 dB. Signal-to-noise ratio of 110 dB. Dynamic range of 110 dB. Gain of 14 dB in balanced mode and 7 dB in unbalanced mode. Jitter level less than -10 ps. Possibility to select the digital filter response type. Five times higher through band and distortion rate ten times smaller than those of the REF CD8 model. Analogue section equipped with four 6H30 double triodes and a regulation section that combines one of the exclusive 6550WE pentodes with a 6H30. Digital inputs (all compatible 24-bit / 192 kHz) USB 2.0HS, balanced AES / EBU coaxial, unbalanced S / PDIF coaxial and EIAJ-TosLink optics. Digital outputs AES / EBU and S / PDIF (with BNC connector). Balanced and unbalanced analog outputs. Dimensions: 480x194x390 mm (W x H x D).